How to Convert WLMP to MP4, AVI, MOV and Other Formats Easily? DVD Video Converter - Convert video from any pop and rare formats. I created a video using Windows Live Movie Maker. The output file is in a .wlmp format. I can only view this video using this application which created it. How could the video be played by regular media player, such as VLC, Windows Media Player, etc? How can I watch it smoothly on my portable gadgets with my friends? Do I need to convert WLMP to MP4, AVI, MOV or other common video formats? Any advice? As you can’t play your WLMP file with your favorite video player and also can’t upload it directly to YouTube, it’s totally troublesome. Here we want to tell you some handy ways to solve the problem with a good WLMP converter. Before that, let’s see what a WLMP file is. With this simplest WLMP converter, you can easily batch convert your WLMP files to any video formats. Play and share your WLMP file whenever you want. Note: only the software can download 4k video and 2k video from YouTube with 100% quality. WLMP files are not actually valid videos, and they’re movie project files created by Microsoft Windows Live Movie Maker. That’s why you can’t watch the output file using some media player like VLC, QuickTime. WLMP contains movie transitions, music, and effects as well as links to digital photos and videos. To play WLMP files you make at any time anywhere, you can use WonderFox DVD Video Converter. 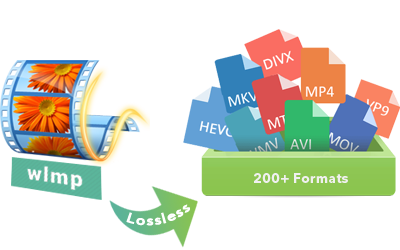 It’s the best solution to convert from WLMP to MP4, convert WLMP to AVI, convert WLMP to MOV and even convert WLMP to MP3 or lossless audio formats. To boot, you can directly transfer WLMP to portable devices compatible media formats. The presets for newest iPhone 8/8 Plus, Samsung S9, Huawei P20 are available. And it also provides optimal profiles for your smart UHD TVs and other popular and common devices. Preparation: Free download WonderFox DVD Video Converter and follow the guide. Click “File” button at the top left > Go “Open Project” to open the .wlmp file. And then click “File” > “Save Movie” > select WMV as a target format from “Save as type”. The video on the right has also shown you the steps of exporting .wlmp as WMV in details. * If you have no Windows Movie Maker on your PC, please download it from Microsoft official sites. * Windows Movie Maker is not supported for Windows 10. Run the .wlmp to MP4 Converter - WonderFox DVD Video Converter. Input the WMV File: Click “Add Files” to input the WMV file. The program also allows you to easily drag and drop video. To save your time, you can simultaneously input multiple files, because it supports high quality batch conversion mode. Open the output format drop-down list on the right side of the main interface. Click an output format that you want to change to. And you’re also able to directly choose a device. Set how to convert WLMP file to MP4 as an example. After opening the Output Format menu, click “Video”, then go “MP4”. With the same steps, you can transcode WLMP to various formats and even devices. It’s friendly to users and easy to handle. The WLMP converter to MP4, AVI, MPG, MOV, MKV, FLV, SWF, MTS, 3GP, ASF, etc. supports a wide range of video formats including (300 + media formats and devices). And if you’d like to directly select an output device, you don’t need to know much about video audio parameters like bitrate, resolution, and sample rate. The program has preset optimized parameters for each device. Besides, you are able to change your original file aspect ratio and resolution as you want. And if you need to increase volume of the video, this converter has a built-in volume booster. After choosing the wanted output format, hit the “Run” button to start the whole converting process. The task will be accomplished in the shortest time, which differs from online tool that takes lots of time to analyze video files due to slow net-connection or its own defects. Now free download WonderFox DVD Video Converter to convert and play WLMP files. WonderFox DVD Video Converter is not only a WLMP to MKV, .WLMP to .MOV and WLMP to AVI converter that can change WLMP to 300+ formats, but also supports you to download YouTube videos & music, rip any protected DVDs with ease including the latest DVDs released by Disney, Paramount, Sony, Warner, etc. Convert any video and audio formats. It helps you convert any video and audio formats with faster conversion speed than many likewise video converters. Stably download YouTube hot video, YouTube newest HD video, Facebook video, Video and videos from many other video sharing sites. You can indeed have a try. Can rip any DVD/DVD Folder/ISO file including DVD with CSS, region code, RCE, Sony ArccOS, UOPs, Disney X-project DRM and the latest encryption techniques. Say, with the program, you can rip DVDs released by Disney, Metro-Goldwyn-Mayer (MGM), Paramount Pictures, Sony Pictures Entertainment, Inc., Warner Bros Pictures, Universal Pictures, UNITED ARTISTS, and 20th Century Fox without question. Built-in advanced editor helps you merge video clips, crop video, trim video, add effects to enhance video, add subtitle or remove subtitle simply. Play any video or film with its built-in player. In addition, everyone can use it to make ringtone for IOS/Android device on their own. This is the whole tutorial. Instead of searching on how to convert WLMP to MP4 online free hard, you are highly recommended to try the methods in this article. Wonderfox DVD Video Converter also works as the best WLMP to WMV, WLMP to MOV converter and more as well. Now, please download the DVD Video Converter to complete your jobs. Convert WLMP and other rare formats to 300+ formats and hot devices. Solve format/device compatibility issues and making high output video and audio quality. Download YouTube video and music to newest devices with retinal display optimization. Lossless audio output; 5.1 channels dolby sound; DTS sound enhancement. Why won't a .wlmp file play?